A broad, definitive history of the profound relationship between religion and movements for social change in America. Though in recent years the religious right has been a powerful political force, making “religion” and “conservatism” synonymous in the minds of many, the United States has always had an active, vibrant, and influential religious Left. In every period of our history, people of faith have envisioned a society of peace and justice, and their tireless efforts have made an indelible mark on our nation’s history. 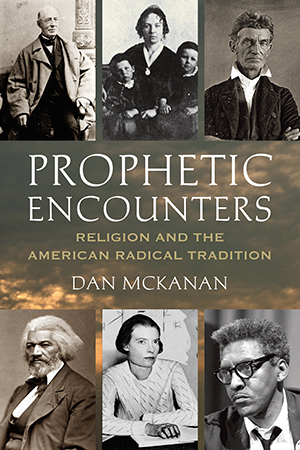 In Prophetic Encounters, Dan McKanan challenges simple distinctions between “religious” and “secular” activism, showing that religious beliefs and practices have been integral to every movement promoting liberty, equality, and solidarity. From Frederick Douglass, John Brown, and Elizabeth Cady Stanton in the nineteenth century to Dorothy Day, Martin Luther King Jr., and Starhawk in the twentieth, American radicals have maintained a deep faith in the human capacity to transform the world. This radical faith has always been intertwined with the religious practices of Christians and Jews, pagans and Buddhists, orthodox believers and humanist heretics. Their vision and energies powered the social movements that have defined America’s progress: the abolition of slavery, feminism, the New Deal, civil rights, and others. In this groundbreaking, definitive work, McKanan treats the histories of religion and the Left as a single history, showing that American radicalism is a continuous tradition rather than a collection of disparate movements. Emphasizing the power of encounter-encounters between whites and former slaves, between the middle classes and the immigrant masses, and among activists themselves-McKanan shows that the coming together of people of different perspectives and beliefs has been transformative for centuries, uniting those whose faith is a source of activist commitment with those whose activism is a source of faith. Offering a history of the diverse religious dimensions of radical movements from the American Revolution to the present day, Prophetic Encounters invites contemporary activists to stand proudly in a tradition of prophetic power. Everyone needs a history, especially those who seek to change the future. When radical activists confront the entrenched legacy of racism and sexism in both our institutions and our textbooks, we are tempted to imagine that all history supports the status quo. In an era in which prominent representatives of American Christianity are outspoken in their support of reactionary politics, it is easy to imagine that the history of religion is doubly conservative. But there have always been American radicals--and those radicals have always drawn strength from their diverse faiths, Christian and Jewish, pagan and Buddhist, orthodox and humanist. To forget our predecessors’ work is not only to risk repeating their mistakes, it is to lose their wisdom and inspiration. And so, as we organize our neighborhoods or march on Washington, we must tell the stories of the cloud of witnesses who came before us. To encounter them is to discover the human sources of radical faith. The empowering encounters of William Lloyd Garrison, Frederick Douglass, Dorothy Day, and Starhawk stand in a tradition that has gone by many names. Some would call it the path of the prophets. Others speak of the “American radical tradition” or simply “the Left.” It is the tradition of abolitionists who called on their neighbors to immediately renounce the sin of slavery, of feminists who recognized patriarchy as itself a form of slavery, of socialists who labored to build a “cooperative commonwealth,” and of pacifists who saw war as the ultimate affront to humanity. What holds this tradition together is the experience I have tried to encapsulate in my opening vignettes. When human beings encounter one another deeply, in the midst of their struggles for freedom and equality and community, prophetic power is unleashed. This is power to denounce, to condemn those who would “grind the faces of the poor into the dust,” in the words of Isaiah. It is also power to announce--to proclaim God’s Kingdom that will be realized here on earth, the beloved community of black and white and brown together, the new society within the shell of the old. Prophetic power enables people to speak boldly in the face of brickbats and bludgeons and fire hoses. It empowers them to tell new stories and build new communities. Because interpersonal encounters are the source of this power, their place within radicalism is analogous to the role of divine revelation within traditional Christianity, Judaism, or Islam. For this reason, I describe them as prophetic encounters. By placing prophetic encounters at the heart of my story, I hope to share three guiding insights about the American radical tradition. First of all, it is a tradition. Too often we remember abolitionism or feminism or socialism as self-contained “movements” that emerged in response to particular social problems and disappeared when those problems were overcome or changed form. Such memories obscure the way in which activists of each generation have built alliances and drawn inspiration, religious convictions, and strategies from those who have gone before. Garrison and Douglass were as eloquent in denouncing the sin of sexism as the sin of slavery, and they helped to inspire the pacifists and socialists of their day. They also pioneered activist tactics that have lasted for centuries. Garrison used his imprisonment for libeling a slave trader to raise awareness of his cause, while Douglass repeatedly refused to leave segregated railway cars until he was expelled by force; Dorothy Day and Starhawk were among the thousands who followed in their footsteps, facing arrest for refusing to participate in civil defense drills or for disrupting the 1999 World Trade Organization meeting in Seattle. One scarcely needs seven degrees of separation to trace the personal connections among the four: Garrison’s grandson was among the founders of the pacifist Fellowship of Reconciliation, which worked with the Catholic Worker movement to sponsor the civil defense protests and Vietnam-era draft-card burnings; the first man to go to prison for draft-card burning would later marry Starhawk. Though the Left has not always been one big happy family, even in its divisions and rancor it has been a family. Second, religious ideas, institutions, and practices have always been intertwined with radical activism. American radicals drew inspiration from religious communities as diverse as Frederick Douglass’s African Methodist Episcopal Church, Dorothy Day’s Roman Catholicism, and Starhawk’s neopaganism. It is common nowadays to speak of a “religious Left” that is distinct from secular radicalism, or to suggest that the prophetic tradition possesses a wisdom lacking in both the “religious Right” and the “secular Left.” Such formulations fail to do justice to the spirituality of even the most seemingly “unchurched” radicals. Many of the most bitter critics of the churches have been people of deep personal faith, inspired by the example of Jesus driving the moneychangers from the temple, while those who have tried to separate radical causes from religious language have often hoped to make room for persons of divergent theologies. Though Dorothy Day’s orthodox Catholic piety was far removed from the dogmatic materialism of the Communist Party, it is not possible to draw a line that neatly separates religious from secular radicals. Indeed--and this is my third guiding insight--leftist activism is almost a form of religion. It occupies much of the same psychological and sociological space. People are drawn to religious communities and radical organizations in order to connect their daily routines to a more transcendent vision of heaven, salvation, or a new society. Both religion and radicalism offer individuals powerful new identities--as “children of God” or “class-conscious workers” or “New Negros.” In order to extend this power, radicals build organizations--social reform societies, utopian communities, third parties--that have many churchlike qualities. Radicals come together to sing hymns and hear sermons, often gathering on Sunday morning; they articulate their defining beliefs and excommunicate those who dissent; their marches are like pilgrimages and their “line-crossing” in civil disobedience like a ritual of initiation. Radicalism is more like a religion than like mainstream political traditions, which suspend questions of transcendence in order to reconcile competing interests and build electorally viable coalitions. To say that radicalism is almost a form of religion is not to deny the tension between the two but to explain it. Radicals seek to live in relation to a better world that might exist here on earth in the future; most conventionally religious people orient their lives to realities beyond this world. While radicals achieve empowered identities through interpersonal encounters, most religions offer a new identity through encoun ter with spiritual beings. (The major exception, religious humanism, has rarely clashed with the Left.) As a result, the relationship between the Left and conventional religiosity has the volatility of sibling rivalry. Some radicals find their religious and radical commitments to be mutually reinforcing; others come to see their cause as the true church. Many American leftists have, from time to time, found themselves in both of these postures. The tensions run deep and should not be dismissed as a matter of secularist prejudice. I will return to these three guiding insights--the Left is a tradition, the Left is thoroughly intertwined with religion, the Left is itself analogous to religion--throughout this book. Before entering into my narrative, it may be helpful to define some terms. I use “Left” and “radicalism” interchangeably to designate a tradition of social movements and organizations that seek to extend the values of liberty, equality, solidarity, and peace. These values are rooted in the American and French revolutions of the late eighteenth century, and American radicalism in particular is defined by its twofold relationship to the heritage of 1776. On the one hand, American radicals place themselves in the legacy of the Revolution. Taking pride in America, they imitate the rhetoric of the Declaration of Independence and hope to persuade all Americans to join their cause. On the other hand, American leftists are radically dissatisfied with the Revolution’s institutional heritage. They refuse to believe that American structures of political democracy will inevitably lead to greater liberty, equality, and solidarity. And they refuse to worry that present agitation will undermine past gains. American radicalism has included movements to end slavery; to include people of all races, genders, and sexualities fully in the national community; to build a cooperative or socialist economy; and to limit or end war and violence. American radicalism as I have defined it excludes incremental forms of progressivism that are more concerned with preserving the institutions of the Revolution than with extending its values; my definition excludes as well as separatist movements that renounce American ideals. Neither Abraham Lincoln nor Franklin Delano Roosevelt, neither Marcus Garvey nor Elijah Muhammad were truly American radicals by my definition, though Garvey and Muhammad were radicals of another stripe. This is not to suggest that true leftists must hold themselves aloof from such people. The Left has learned from Garvey’s and Muhammad’s passionate devotion to their people, and it has often embraced tactical separatism as a way of empowering people for sustained struggle. Similarly, the Left’s critique of institutions does not preclude fruitful dialogue with persons who support those institutions. True radicals have never been comfortable within the two-party system of American politics, but some have worked to nudge the parties to more radical ground. Others have cheered from the sidelines when men like Lincoln and Roosevelt embraced elements of their agenda. Similarly, radicals hold multiple allegiances--to specific religious traditions, to their crafts or professions, to their ethnic communities. To say that Dorothy Day was part of the radical tradition, heir to the legacy of Garrison and Douglass, is not to deny that she was also part of the Catholic tradition and heir to the legacy of Thomas Aquinas and Thrse of Lisieux. Unlike Catholicism, radicalism has lacked a continuous institutional framework to help preserve a consciousness of tradition. As a result, it is easy to imagine that Catholicism was the only tradition that shaped Day’s activism in a profound way, or that the black church was the only tradition informing Martin Luther King Jr. My task is to correct this impression by tracing the contours of the tradition all radicals shared, not to diminish the contributions of other traditions. My view of the Left as a tradition does not deny the presence of deep divisions among radicals. Radicals have maintained a sense of shared identity in part by arguing about the best way to promote liberty, equality, and solidarity. Pacifists and revolutionaries repeatedly squared off over the question of whether nonviolent suffering or holy violence was the best way to change institutions. When anarchists and Marxists split over the role of the state in bringing about a cooperative commonwealth, they echoed a nineteenth-century debate between nonvoting Garrisonians who believed that the U.S. Constitution was inherently proslavery and Liberty Party members who countered that its antislavery potential needed only to be unleashed. Other radical debates focused on the value of small-scale utopian experiments, the merits of single-issue organizing versus comprehensive programs of reform, and the best way to reconcile the tensions among liberty, equality, and solidarity. A persistent and bitter debate concerned the family: was it better understood as yet another oppressive institution or as a sacred gift threatened by unjust institutions? Debates over how the Left should interact with mainstream religion also shaped radicalism. These debates contributed to bitter feelings and organizational schisms, but could not bring the conversation to an end. Dorothy Day had strong positions on all the issues I just listed, and she recognized Fidel Castro as a comrade even though his views were diametrically opposed to hers. Given the scope of this book, I will devote more space to the debate over religion than to the others, but all would be of vital importance in a comprehensive history of American radicalism. As I have defined it, radicalism is concerned with relationships among people, rather than with human connections to spiritual realities or the material world. The Left as such is not committed to any particular understanding of God or spirits, nor does it prescribe specific practices of diet, dress, or sexual behavior. Yet in practice it is rarely possible to separate human relationships from spiritual and material realities. For many activists, radical commitment has been unthinkable apart from belief in God, or from communication with the spirits of the deceased, or from the practice of free love or abstinence from alcohol. At specific historical moments, certain correlations have been almost ubiquitous on the left: it would be almost as difficult to find an 1840s radical who opposed the temperance movement as a 1990s leftist who opposed recycling. My narrative will thus intersect with the stories of temperance and environmentalism as well as of such religious movements as Quakerism, Universalism, and Spiritualism. But I make no claim to tell the whole stories of such movements, and I insist that none of them has ever been entirely identified with American radicalism. Like “radicalism,” the term “religion” is notoriously difficult to define. I use it in two senses, corresponding roughly to my second and third guiding insights. On the one hand, I sometimes define religion as whatever people say it is--practices, institutions, and ideas that are conventionally labeled religious. Thus, I will track the intertwining between radicalism and such practices as Sunday morning worship, such organizations as the United Methodist Church, and such ideas as the claim that all people are created in God’s image.